FeastHome Reviews – Everyone loves fried foods for their tastiness. But, they’re usually dripping with fatty grease, which is a bit gross and can lead to a possible health issue when consumed in excess. That’s where the best air fryer comes to play, as a method to fry your foods without drenching them in oil. When determining whether or not to purchase an air fryer, it’s essential to ask yourself why you need one. It is said that air fryers may not be able to replicate the texture or taste of traditional fried food completely. However, they can still provide a crisp exterior and moist interior. Air fryers work by circulating air around the food inside, so they can cook the food like the way a typical oven could. If an air fryer is for you, there will be so many options available out there. But, don’t worry since I’ve done the research for you. So, let’s check this out. 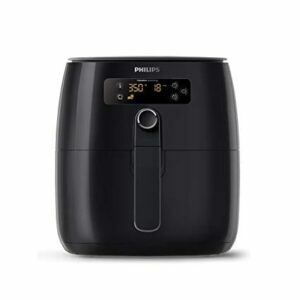 There are a bunch of air fryers available in the market, but there are also a bunch of reasons why the Philips HD9641/96 is the perfect one for you. Moreover, the average Amazon rating for this product is also impressive: 4.4 out of 5, proving its satisfying feature for a variety of customers. It cooks your food evenly. The product’s interface is uncomplicated to use. It won’t take much space in your kitchen than other products. The price is a bit expensive. 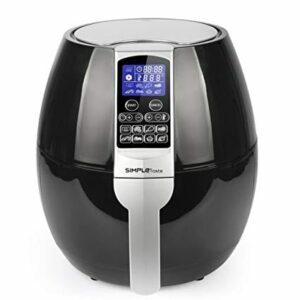 SimpleTaste has some great air fryers, and this product is one of its best. This device shows off an immense eight preset programs, including features for chicken, meat, shrimp, meat, and more. All the functions are simple to use. The price is less expensive than the previous product. It has a small capacity only. Compared to Philips or Black & Decker, T-Fal may not as popular as them. 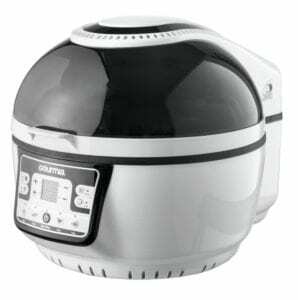 However, the ActiFry can be considered as the best air fryer especially for you who need a dependable air fryer to cook for your family. The product is easy to use. It comes with a built-in paddle. The temperatures cannot be controlled manually. It is a bit expensive considering the features. 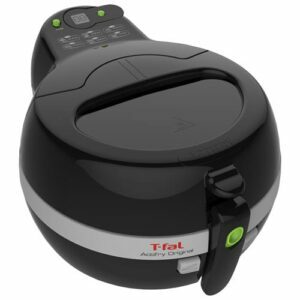 If you’re searching for an air fryer product that can be used for a larger family, the Cuisinart TOA-60 will make a great choice for you. This all in one machine is more versatile than a standard air fryer available in the market. Like a toaster oven which combines convection oven and air fryer function, this device offers so much for you. It currently owns a 4.2-star average on Amazon with more than 900 reviews. 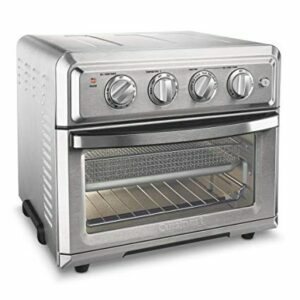 It provides everything you need for a toaster oven and an air fryer. The product is much larger than the standard air fryers, so it may take much space on your counter. You can still jump on the air fryer trend although if there are just two of you at home, or probably even one. 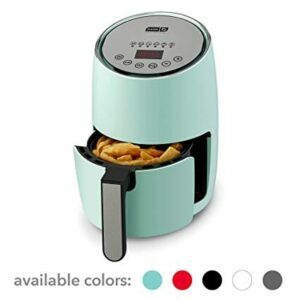 This cute little Dash Compact Air Fryer is available on Amazon for cooking small serves of sweet potatoes and other recipes. It comes in a variety of color options including white, black, red, and aqua. It comes at a cheap price. It isn’t suitable for a larger family. Do you need the best air fryer which comes at an affordable price? You will love this digital air fryer. The product offers a 5.8-quart basket as well as a non-stick coating, making your food is easy to take out after cooking. It comes in eight cooking presets, including options for pork, cake, pizza, chicken, and fries. It is perfect for a tight budget. You may need to adjust the cooking time for the better. 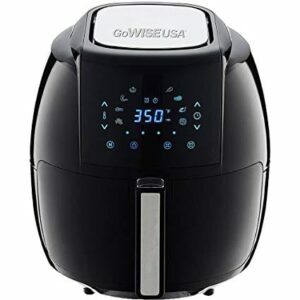 If you are searching for a versatile air fryer, this product makes a great deal for you. Not only works as air frying, but the Gourmia GTA2500 also works as a rotisserie, steamer, and grill. So, you’ll have so many opportunities to set it up and cook some dinner. It comes in a non-stick interior for easy cleaning. It features additional free accessory kits including frying tumbler, lifting tongs, grill basket, steaming pan, and many more. The basket is reported to be not really sturdy. That’s all the seven best air fryers on some different categories that you can find in the market. All these products are available on Amazon, so you can check the best air fryer you are interested in here right away. Happy shopping! Have Many Trouble in Indoor Kitchen? Install The Outdoor One! FeastHome offers the freshest ideas in kitchen decoration, improvement, remodel, hacks, and kitchen interior design. We are very passionate in kitchen design and we love to share our thoughts to you.